Devin J. Rolle, 29, 51 Hobart St., Meriden, was charged on Nov.1 with failure to respond in infraction. Mariusz Nadolny, 30, 55 Rackliffe Drive, was charged on Nov. 1 with illegal operation of moving vehicle under the influence of alcohol/drugs, illegal operation of motor vehicle under suspension and failre to comply with fingerprint request. Hector Rivera, 54, 160 West St., second floor, New Britain, was charged on Nov. 1 with extradition arrest by warrant. Craig Lawton, 55, 312 Cedar St., Newington, was charged on Nov. 1 witrh illegal operation under influence of alcohol/drugs, evading responsibility injury/property damage, illegal operation of moving vehicle without minimum insurance and following too closely. Amanda J. Sargis, 37, 242 Main St., Apt. 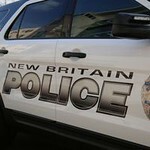 8, New Britain, was charged on Nov. 2 with disorderly conduct and third-degree assault. Brayan Ocasio, 19, 38 Lincoln St., Apt. 3, third floor, New Britain, was charged on Nov. 2 with interfere with officer/resisting. Disobeying signal of officer, improper use-marker, illegal operation of motor vehicle without minimum insurance, operation of unregistered motor vehicle, operating motor vehicle without a license, reckless driving and two counts of assault on public safety officer. Justin Ruiz, 18, 10 Beatrice Ave., Bloomfield, was charged on Nov. 2 with two counts of fourth-degree larceny and two counts of third-degree burglary. Jose G. Soto, 27, 2326 Corbin Ave., New Britain, was charged on Nov. 2 with sixth-degree larceny. Jeffrey D. Pitkin, 45, 12 London Road, Windsor, was charged on Nov. 2 with violation of probation. Francisco Perez, 66, 55 West Main St., New Britain, was charged on Nov. 2 with sixth-degree larceny and two counts of first-degree criminal mischief. Kyle E. Stohl, 26, 35 Mead St., Unit D, New Britain, was charged on Nov. 2 with second-degree breach of peace and third-degree criminal mischief. Julio Sanchez, 46, 10 Walnut Apt. 107, New Britain, was charged on Nov. 2 with extradition arrest no warrant. Posted in New Britain Herald, New Britain on Tuesday, 6 November 2018 22:13. Updated: Tuesday, 6 November 2018 22:15.